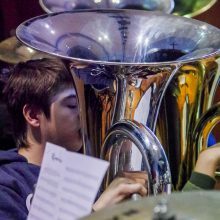 Join 700 school children and LYBB ensemble band for a beautiful concert for Armistice. The Head Teacher of Barnacre Primary School, Longridge, has written an amazing show called “Armistice 1914-18 – The Great War Remembered”, and it will be performed twice on Sunday 11th November at Preston Guild Hall. This will be an exciting show of not just music, but also dance, drama and art, and it tells the story of the Great War. This large scale performance involved 700 children and around 15-20 LYBB players. There will be some on-stage marching in costumes, and LYBB will be playing before each performance and at the intervals in the foyer.